Flower tattoos of all shapes, sizes, colors and species are extremely popular tattoo designs amongst women. The hibiscus flower itself has meanings in multiple cultures around the world, all of which can be translated into tattoo designs to be worn by women everywhere. In Tahiti, a red hibiscus is tucked behind the ear of Tahitian women to show their readiness and availability for marriage. Take this symbol a step further to have it connote a readiness and availability to handle whatever life is bringing your way with a red hibiscus tattoo design. Nearly all parts of the hibiscus flower are edible and are used in medicinal teas, brews and even desserts around the world. Let the image of the hibiscus flower nourish your soul as part of a floral tattoo. "Seizing the opportunity" is the motto of the hibiscus flower. It blooms for an extremely short period of time, meaning that the user must strike while the iron is hot and seize the day. Show off your readiness to seize any opportunity that comes your way with a hibiscus tattoo. Multiple species of the hibiscus flower exist, which means the image of the hibiscus can have many variations as well. Try out any of these ideas to help find the right hibiscus tattoo for you. The hibiscus is a relatively large flower, which opens its petals wide. Place a single bloom with or without leaves anywhere on the body as an opening. Include the hibiscus in any floral tattoo which contains multiple flowers. The hibiscus can be seen on a vine, weaving its way through another design, or as part of a flower garden with multiple blooms represented, each with its own meaning. 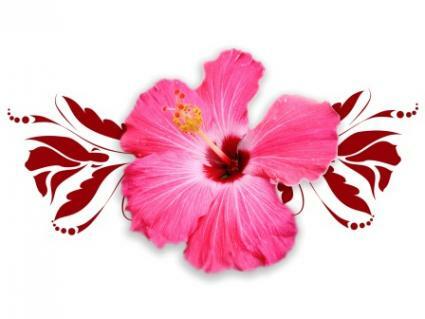 Why not take the Tahitian meaning a step further by including a red hibiscus flower image in a tribal tattoo? Center the bloom on a tribal tattoo on the arm or wrist as a band to display your availability to whatever comes your way. While the hibiscus image is beautiful on its own, why not pair it up with another image? The hibiscus works well with the image of the hummingbird, flitting about the flower, or with a butterfly landing gracefully on top. If one flower is too plain an image, try stacking some hibiscus flower images up a vine. The flowers can be the same or varying colors and the vine can be placed on the arm, the center of the back, or the calf for a beautiful effect. Keep the flower images close together to make the most of the image. Alternatively, two hibiscus flowers could be placed on either side of vine stretching horizontally across the back. A hibiscus tattoo design is sensual, colorful and full of meaning. Adorning your body with this image is sure to bring the opportunity for seizing power of the hibiscus into your life and into your hands.